The Miraculous Medal design was executed by Adrien Vachette based on Saint Catherine Labouré visions. 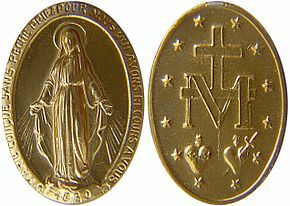 The Miraculous Medal (French: Médaille miraculeuse), also known as the Medal of Our Lady of Graces, is a devotional medal, the design of which was originated by Saint Catherine Labouré following her apparitions of the Blessed Virgin Mary in Rue du Bac, Paris, France, and made by goldsmith Adrien Vachette. According to the teaching of the Catholic Church, the use of sacramentals such as this medal prepares people to receive grace and disposes them to cooperate with it. 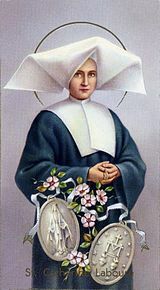 Catherine Labouré stated that on 19 July 1830, the eve of the feast of Saint Vincent de Paul, she woke up after hearing the voice of one child calling her to the chapel, where she heard the Virgin Mary say to her, "God wishes to charge you with a mission. You will be contradicted, but do not fear; you will have the grace to do what is necessary. Tell your spiritual director all that passes within you. Times are evil in France and in the world." The Chapel of Our Lady of the Miraculous Medal in Paris. On 27 November 1830 Catherine reported that the Blessed Mother returned during evening meditations. She displayed herself inside an oval frame, standing upon a globe. She wore many rings set with gems that shone rays of light over the globe. Around the margin of the frame appeared the words Ô Marie, conçue sans péché, priez pour nous qui avons recours à vous ("O Mary, conceived without sin, pray for us who have recourse to thee"). 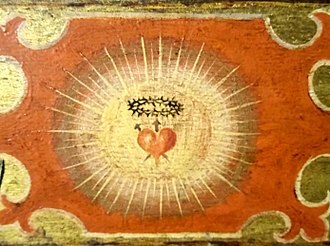 As Catherine watched, the frame seemed to rotate, showing a circle of twelve stars, a large letter M surmounted by a cross, and the stylized Sacred Heart of Jesus crowned with thorns and Immaculate Heart of Mary pierced with a sword. Asked why some of the gems did not shed light, Mary reportedly replied, "Those are the graces for which people forget to ask." Sister Catherine then heard the Virgin Mary ask her to take these images to her father confessor, telling him that they should be put on medallions, and saying "All who wear them will receive great graces." Sister Catherine did so, and after two years of investigation and observation of Catherine's ordinary daily behavior, the priest took the information to his archbishop without revealing Catherine's identity. The request was approved and medallions were designed and produced through goldsmith Adrien Vachette. The chapel in which Saint Catherine experienced her visions is located at the mother house of the Daughters of Charity in Rue du Bac, Paris. The incorrupt bodies of Saint Catherine Labouré and Saint Louise de Marillac, a co-founder of the Congregation of the Daughters of Charity of Saint Vincent de Paul, are interred in the chapel, which continues to receive daily visits from Catholic pilgrims today. Pope John Paul II used a slight variation of the reverse image as his coat of arms, the Marian Cross, a plain cross with an M underneath the right-hand bar (which signified the Blessed Virgin at the foot of the Cross when Jesus was being crucified). 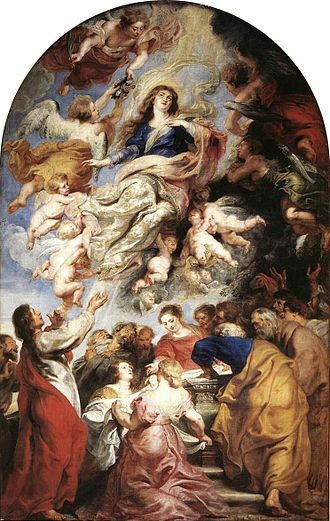 • Words from the vision form an oval frame around Mary: "O Mary, conceived without sin, pray for us who have recourse to thee." • Mother — Her open arms, the "recourse" we have in her. • Immaculate — The words, "conceived without sin." • Assumed into Heaven — She stands on the globe. • Mediatrix — Rays from her hands symbolizing "graces." • Our Protection — Crushes the serpent (Gn 3:15). • A cross-and-bar surmounts a large, bold "M."
• 12 stars disperse around the perimeter. • Two hearts are depicted underneath the "M," the left lapped with a crown of thorns, the right skewed by a sword. From each, a flame emanates from the top. Again, employing a grid analysis, we can see how the reverse-side design contains great symbolism reflecting major tenets of the Catholic faith. • Flames — The burning love Jesus and Mary have for us. ^ "CCC, 1674". Vatican.va. Retrieved 2 May 2017. ^ "CCC, 1670". Vatican.va. Retrieved 2 May 2017. ^ Dirvin, C.M., Joseph I. (1958). Saint Catherine Laboure of the Miraculous Medal. Tan Books & Publishers, Inc. ISBN 0-89555-242-6. ^ " I saw rings on her fingers, three rings to each finger, the largest one near the base of the finger, one of medium size in the middle, the smallest one at the tip. Each ring was set with gems, some more beautiful than others..." Catherine Labouré, quoted in John Delaney, A Woman Clothed With The Sun, Doubleday, 1960, p. 77. ^ McMenamin, M. 2010. Precisely dated early versions of the Miraculous Medal. Numismatics International Bulletin, v. 45, nos. 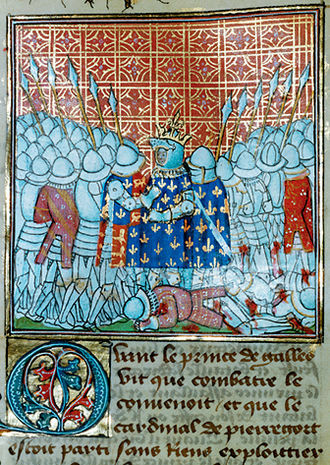 3/4, p. 43-48. ^ Mack, John (2003). 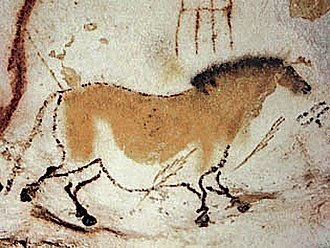 The museum of the mind: art and memory in world cultures. British Museum. ^ Mauriello, Rev. Matthew R. (1996). "The Miraculous Medal". Fairfield County Catholic. Retrieved 21 December 2012. Rene Laurentin, Catherine Laboure: Visionary of the Miraculous Medal, Pauline books and Media, Boston, 2006, ISBN 0-8198-1578-0. Its members make annual vows throughout their life, which leaves them always free to leave, without need of ecclesiastical permission. They were founded in 1633 and are devoted to serving Jesus Christ in persons who are poor through corporal and spiritual works of mercy. They have been known in France as the Grey Sisters from the color of their traditional religious habit. The 1996 publication The Vincentian Family Tree presents an overview of related communities from a genealogical perspective and they use the initials DC after their names. In the past, when they were simply as the Sisters of Charity of St. Joseph. The institute was founded by Saint Vincent de Paul, a French priest, and Saint Louise de Marillac, the need of organization in work for the poor suggested to de Paul the forming of a confraternity among the women of his parish in Châtillon-les-Dombes. It was so successful that it spread from the districts to Paris. The majority sent their servants to minister to those in need, Vincent de Paul remedied this by referring young women who inquired about serving persons in need to go to Paris and devote themselves to this ministry under the direction of the Ladies of Charity. Marguerite Naseau, a 34-year-old woman from the countryside in Suresnes, in 1630 she met up with Vincent and Louise in Paris, where they suggested that she help the Ladies of Charity. These young women formed the nucleus of the Company of the Daughters of Charity now spread over the world, on 29 November 1633, the eve of St. Andrew, de Marillac began a more systematic training of the women, particularly for the care of the sick. 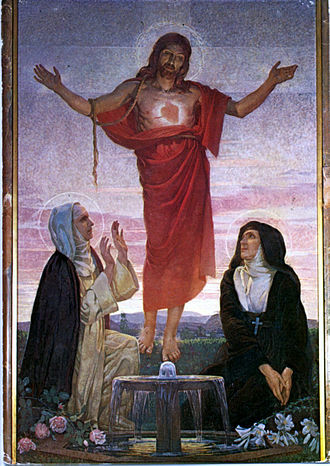 The sisters lived in community in order to develop the spiritual life and thus, more effectively. The Daughters of Charity differed from other congregations of that time in that they were not cloistered. 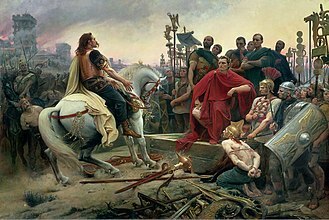 They maintained the necessary mobility and availability and lived among those whom they served, from the beginning, the community motto was, The charity of Christ impels us. The hospital of St John the Evangelist in the province of Angers was the first hospital entrusted to the care of the Daughters of Charity, anticlerical forces in the French Revolution were determined to shut down all convents. Saint Louise de Marillac, D. C. Louise Le Gras was the co-founder, with Saint Vincent de Paul, of the Daughters of Charity. She is venerated as a saint by the Roman Catholic Church and she was born out of wedlock on August 12,1591 near Le Meux, now in the department of Oise, in Picardy. Louis de Marillac, Lord of Ferrires, claimed her as his natural daughter yet not his legal heir, louis was a member of the prominent de Marillac family and was a widower at the time of Louise’s birth. Her uncle, Michel de Marillac, was a figure in the court of Queen Marie de Medici and, though Louise was not a member of the Queen’s court. Thus Louise grew up amid the affluent society of Paris, when her father married his new wife, Antoinette Le Camus, she refused to accept Louise as part of their family. 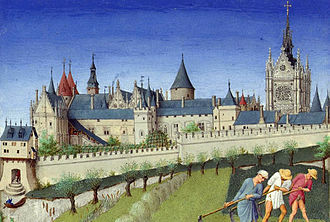 Nevertheless, Louise was cared for and received an excellent education at the monastery of Poissy near Paris. Louise was schooled among the elite and was introduced to the arts. She remained at Poissy until her fathers death, when she was years old. Louise stayed with a good, devout spinster, and from her, around the age of fifteen, Louise felt drawn to the cloistered life. She made application to the Capuchin nuns in Paris but was refused admission and it is not clear if her refusal was for her continual poor health or other reasons, but her spiritual directors prophetic response to her application was that God had other plans for her. Devastated by this refusal, Louise was at a loss as to the step in her spiritual development. When she was 22, her family had convinced her that marriage was the best alternative and her uncle arranged for her to marry Antoine Le Gras, secretary to Queen Marie. Antoine was a young man who seemed destined for great accomplishments. Louise and Antoine were wed in the fashionable Church of St. Gervaise on February 5,1613, in October, the couple had their only child, Michel. Louise grew to love Antoine and was a mother to their son. Along with being devoted to her family, Louise was active in ministry in her parish and she had a leading role in the Ladies of Charity, an organization of wealthy women dedicated to assisting those suffering from poverty and disease. A devotional medal is a medal issued for religious devotion most commonly associated with Roman Catholic faith, but sometimes used by adherents of the Orthodox and Anglican denominations. In the present article we are concerned only with religious medals and it was at one time doubted whether anything in the nature of a purely devotional medal was known in the early ages of Christianity. Certain objects of this kind were described and figured by seventeenth-century writers on the Catacombs, a moments consideration will establish the intrinsic probability of the existence of such objects. 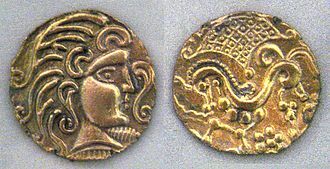 The use of amulets and talismans in pagan antiquity was widespread, the word amuletum itself occurs in Pliny, and many monuments show how objects of this kind were worn around the neck by all classes. 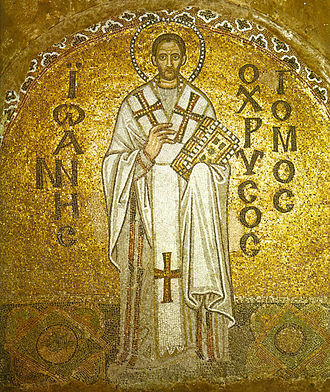 Many early Christians no doubt did make use of devotional medals, the letter of Gregory the Great to St. Mellitus about the dedication of pagan temples, preserved to us by Bede, supplies perhaps the most famous example. Moreover, we know that the same St, hence we find many of the fathers of the fourth and centuries protesting more or less vigorously against these Gnostic phylacteries. In Africa, the molds have been found in which little crosses were cast with rings to hang them by, two or three of these are specially famous. On one side we see represented the martyrdom of a saint, presumably St. Lawrence, the Christian character of the scene is shown by the chi-rho chrisma, the alpha and omega, and the martyrs crown. On the reverse is depicted the tomb of St. Lawrence, the scene no doubt represents the consecration to God of the child as an oblate by his father before the shrine of some martyr, a custom for which there is a good deal of early evidence. Other medals are much more simple, bearing only the chrisma with a name or perhaps a cross and it bears two portrait types of the heads of the Apostles SS. Peter and Paul, and is assigned by de Rossi to the second century, how far the use of such medal of devotion extended in the early Church it is not easy to decide. St. Vincent de Paul was a French Roman Catholic priest who dedicated himself to serving the poor. He is venerated as a saint in the Catholic Church and the Anglican Communion and he was renowned for his compassion and generosity and is known as the Great Apostle of Charity. Vincent was born in 1581 in the village of Pouy in Gascony, in the Province of Guyenne and Gascony, there was in the vicinity, a stream named the Paul and it is believed that this might have been the derivation of the family name. He wrote the name as one word – Depaul, possibly to avoid the inference that he was of noble birth and he had three brothers – Jean and Gayon, and two sisters – Marie and Marie-Claudine. At an early age, he showed a talent for reading and writing but during his childhood, at 15, his father sent him to seminary, managing to pay for it by selling the family’s oxen. Vincents interest in the priesthood at that time was largely with the intent to establish a career and obtain a benefice, with which he could retire early. For two years, Vincent received his education at a college in Dax, France adjoining a monastery of the Friars Minor where he, in 1597, he began his studies in the Faculty of Theology at the University of Toulouse. The atmosphere at the university was anything but pious or conducive to spiritual contemplation, fights broke out between various factions of students which escalated into many armed battles. During the course of the unrest, an official was murdered by two students, nevertheless, he continued his studies and was finally able to help pay for his education by tutoring others. He was ordained on 23 September 1600 at the age of nineteen in Château-lÉvêque, rather than respond to a lawsuit in which he would probably not have prevailed, he resigned from the position and continued his studies. On 12 October 1604 he received his Bachelor of Theology from the University of Toulouse, he received a Licentiate in Canon Law from the University of Paris. De Paul was auctioned off as a slave to the highest bidder and his first master was a fisherman, but Vincent was unsuitable for this line of work due to sea-sickness and was soon sold. A pilgrim is a traveler who is on a journey to a holy place. Typically, this is a journey to some place of special significance to the adherent of a particular religious belief system. 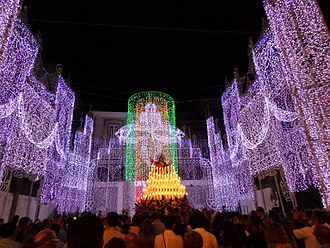 Pilgrims and the making of pilgrimages are common in many religions, including the faiths of ancient Egypt, Persia in the Mithraic period, India and Japan. 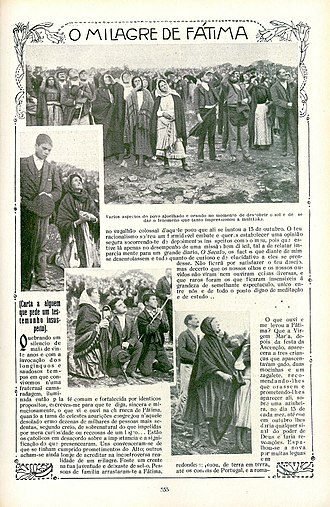 The Greek and Roman customs of consulting the gods at local oracles, such as those at Dodona or Delphi, in Greece, pilgrimages could either be personal or state-sponsored. In the early period of Hebrew history, pilgrims traveled to Shiloh, Bethel, while many pilgrims travel toward a specific location, a physical destination is not always a necessity. One group of pilgrims in early Celtic Christianity were the Peregrinari Pro Christ, or white martyrs and this sort of pilgrimage was an ascetic religious practice, as the pilgrim left the security of home and the clan for an unknown destination, trusting completely in Divine Providence. These travels often resulted in the founding of new abbeys and the spread of Christianity among the population in Britain and in continental Europe. Many religions still espouse pilgrimage as a spiritual activity, the great Islamic pilgrimage to Mecca, is an obligatory duty at least once for every Muslim who is able to make the journey. Other Islamic devotional pilgrimages, particularly to the tombs of Shia Imams or Sufi saints, are popular across the Islamic world. International Bible Students Association pilgrims were excellent speakers, and their talks were typically well-publicized and well-attended. 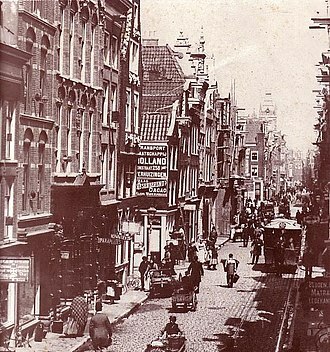 A modern phenomenon is the cultural pilgrimage which, while involving a journey, is secular in nature. An example might be a baseball fan visiting Cooperstown, New York, destinations for cultural pilgrims include Auschwitz concentration camp, Gettysburg Battlefield or the Ernest Hemingway House. Under communist regimes, devout secular pilgrims visited locations such as the Mausoleum of Lenin, the Mausoleum of Mao Zedong, sites such as these continue to attract visitors. The distinction between religious, cultural or political pilgrimage and tourism is not necessarily always clear or rigid, pilgrimage could refer symbolically to journeys, largely on foot, to places where the concerned person expect to find spiritual and/or personal salvation. Rue du Bac is a street in Paris situated in the 7th arrondissement. The street, which is 1150 m long, begins at the junction of the quais Voltaire and Anatole-France, the street used to be in the fashionable Faubourg Saint-Germain. Rue du Bac is the name of a station on line 12 of the Paris Métro, rue du Bac owes its name to a ferry established toward 1550 on what is now the quai Voltaire, to transport stone blocks for the construction of the Palais des Tuileries. It crossed the Seine at the site of todays Pont Royal, the street was named grand chemin du Bac, ruelle du Bac and grande rue du Bac. N°1, Building by Auguste Rolin and C, n°s 83-85, Former monastery of the Immaculate Conception built in 1637. It occupied numbers 87 and 89 rue de Grenelle onto which the garden extended, n°97, Hôtel de Ségur, This house was built in 1722 for Pierre Henry Lemaître, perhaps for François Debias-Aubry. Some of the interior dates to this period. From 1786 to 1792 and from 1796 to 1798 it was occupied by Madame de Staël, n°101, Hôtel de La Feuillade. N°s 2-4, The Caisse des dépôts et consignations, the financial institution created in 1816 to control financial affairs in the publics interest. N°40, The door of this building opens on a passage to the rue du Bac. Inside the passage was the Hôtel Cochin where lived Charles de Montalembert, n°44, In 1932, André Malraux composed a portion of Mans Fate, or La Condition humaine. N°46, Outside door has panels representing Prudence and Law sculpted by Michel Varin, the original 18th century interior had sumptuous wood paneling adorned with work by the painters Carle Van Loo, Jean-Baptiste Oudry, Jean II Restout. It was dispersed at the end of the 19th century, some of its elements have been redisplayed at the musée Jacquemart-André, the Hôtel de Pontalba and the castle of Vaux-le-Pénil. N°70, Building from the years 1830-1840, n°102, Hôtel de Sainte-Aldegonde, built in the first half of the 18th century. N°110, Across courtyard and house constructed in 1812 for himself by Pierre-Louis Baltard, the ground floor of the house was occupied by James McNeill Whistler from 1892 to 1901. Incorruptibility is a Roman Catholic and Eastern Orthodox belief that divine intervention allows some human bodies to avoid the normal process of decomposition after death as a sign of their holiness. Bodies that undergo little or no decomposition, or delayed decomposition, are referred to as incorrupt or incorruptible. Incorruptibility is thought to even in the presence of factors which normally hasten decomposition, as in the cases of saints Catherine of Genoa, Julie Billiart. In Roman Catholicism, if a body is judged as incorruptible after death, canon law allows inspection of the body so that relics can be taken and sent to Rome. The relics must be sealed with wax and the body must be replaced after inspection and these ritual inspections are performed very rarely and can only be performed by a bishop respecting canon law. A pontifical commission can authorize inspection of the relics and demand a written report, after solemn inspection of the relics, it can be decided that the body is presented in an open relicary and displayed for veneration. Catholic law allows saints to be buried under the altar, so Mass can be celebrated above the corpse, the relics of Saint Bernadette were inspected multiple times, and reports by the church tribunal confirmed that the body was preserved. The opening of the reliquary was attended by multiple canons, the mayor and the bishop in 1919, not every saint, however, is expected to have an incorruptible corpse. Although incorruptibility is recognized as supernatural, it is no longer counted as a miracle in the recognition of a saint, embalmed bodies were not recognized as incorruptibles. Incorruptibility is seen as distinct from the preservation of a body. Incorruptible bodies are said to have the odour of sanctity, exuding a sweet or floral. To the Eastern Orthodox Church, incorruptibility continues to be an important element for the process of glorification, an important distinction is made between natural mummification and what is believed to be supernatural incorruptibility. There are a number of eastern Orthodox saints whose bodies have been found to be incorrupt and are in much veneration among the faithful. A Fivefold Scapular sits atop a copy of the Holy Bible. The Scapular of Our Lady of Mount Carmel (Brown Scapular). 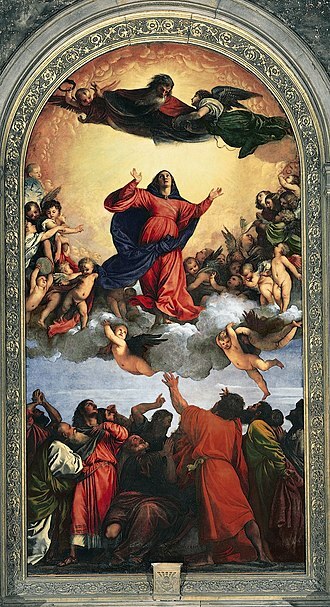 The Scapular of the Immaculate Conception (or Blue Scapular). The Scapular of the Most Holy Trinity (White Scapular). Until 1964, the traditional religious habit included a large, starched cornette. The body of Saint Louise de Marillac in the Chapel of Our Lady of the Miraculous Medal at 140 Rue du Bac, in Paris, France. Saint Jean Eudes (1601-1680) was called the "father, teacher and first apostle" of devotions to the Hearts of Jesus and Mary by two popes. The Green Scapular with a small medal of Saint Benedict. Four Catholic devotional medals. From left to right, they depict the apparition of Our Lady of Lourdes to St. Bernadette; St. Bridget; Our Lady of Guadalupe; and St. Kateri Tekakwitha.